I hate u IndiBlogger .. Ignorance was bliss until 4th Feb 2014, I was ignorant of your existence. But that unfortunate day I happened to see you for the first time.Like a hungry kid entering a new restaurant who didn't know what to order, I looked at the website menu to check what you offered. On the cover page it said We blog , Therefore we are (hmmm that sounds interesting). As I glanced through the menu there were so many contests and luring prizes. I looked at the various courses mentioned Today's popular blog posts, new blogs, recent activities, active Indi bloggers, topics, cities, indian languages too (wow), this visual sight arouse so many questions in me. What was Indivine? Indirank ? ( reminded me of school report cards). Given the fact that i am not much of a Internet surfer, slowly I started exploring this whole new world, layer by layer which seemed so real and full of life. I found short, sweet and clear answers to most of my questions at the bottom of the site . Even though the question Who are you guys? was cleverly dodged. For appetizers, I chose Entertainment. Offbeat and personal was my main course. Love and relationships was what I savored the most. I was full but how can I forget the dessert, so quickly gulped few lifestyle blogs. I just kept eating (reading) for hours. I had found my old friends, each one of the blogs I ate (read) made me feel I knew the chef personally. Each blog had a different flavor, each writer chose different blend of spices, all cooked in their unique styles these dishes were served in the best possible way. I was green with envy, when I saw golden stars and red hearts, as this was my dream. To receive compliments and complaints. I had suppressed this desire for years, how will I make up for the lost time. I had given enough excuses, Now it was time to embrace myself, fight my insecurity of a limited vocabulary, to break from the fear of failing without even trying. I know before the start I need to brush up my grammar, punctuation and capitalization rules, need a few English tenses and preposition lessons. But I cant wait, because I have a story to tell. With a hope to be a part of your world, and a promise to give you more. Thanks Sonia, I thought it would be a long wait before i get my first comment. Thanks Saniya , I thought it would be a long wait before i get my first comment. Hehe.. certainly a good platform for budding bloggers. Well never judge a blog by its title ..thank you ! Believe me IndiVine and IndiBlogger is a wonderful place to share your opinion, views, etc. and you would never hate them. I was a member over there for so long, but never give a try to their menu as you did, but recently when I went to attend one IB meet, I realized that they are such a nice group to be a part of, and since then I became an active member over there. 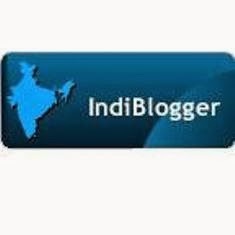 I absolutely love IndiBLOGGER ,It's like a whole new world.I owe my blog to them, what more can i say. Hey Jyotsna ,Agreed its addictive but am loving it!